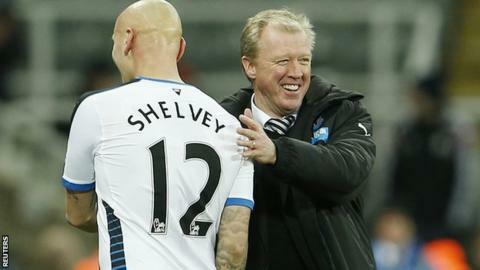 Newcastle's £83m spending spree since the end of last season is "just the beginning", says manager Steve McClaren. The Magpies spent £29m in January and had a £21m offer for striker Saido Berahino rejected by West Brom the day before transfer deadline day. "We wanted to take this club forward, and that will only progress through investment," said McClaren. "To make a huge bid like that for Saido shows the ambition we've got." Newcastle signed Jonjo Shelvey from Swansea, Andros Townsend from Tottenham and Henri Saivet from Bordeaux on permanent deals and Roma's Seydou Doumbia on loan during the January transfer window. McClaren said the signing of 22-year-old Berahino would have been a "bonus". "It's a very, very good squad now," he said. "This window was important. I am very pleased with it. "We've done great business - they're four very good signings. "Now we have to gel everybody together and, the last third of the season, really go for it." Newcastle, who are in the Premier League relegation zone, face Everton at Goodison Park on Wednesday.